This project consists of five 5' x 3' windows separating the dining room and kitchen of the Hotel Castillan, Alpe d'Huez, France. Alpe d'Huez is located high in the Rhône-Alpes region, famous for its many skiable slopes and its stage in the Tour de France. I have been creating stained glass windows here for about three years after reopening the business that I operated in the United States. Previously, the largest job I did in the States was to re-lead the windows of a small church. The Castillan project is my largest and most rewarding start-to-finish job to date. I have been using Glass Eye 2000 for at least ten years. I remember being reluctant to give up drawing patterns by hand, but without it my current creativity and project sizes would not have been possible. 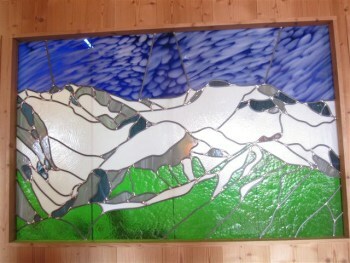 For this project, I used a combination of American glasses from Spectrum and Wissmach for the mountains, forest and snow, along with St Juste-St Gobain hand-blown Barrio, French glass for the sky. French lead is pure 100% lead and very pliable; therefore, I imported Cascade ¼" lead from the United States for more strength. Flat steel rebar reinforcing was used for support. 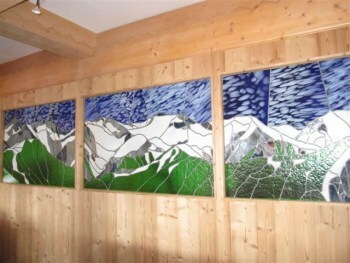 The motif of a mountain landscape was suggested by my clients Julian and Stephanie Castillan. I immediately knew I wanted to recreate the mountain chain as seen to the south of the resort. To capture this perspective, I took five continuous photographs from a well-positioned apartment building. I ambitiously drew the lines using Glass Eye 2000 in a way that would bring the landscape into three dimensions. Because the photograph was taken in the spring, there was still plenty of snow to contrast with the rock and forest. 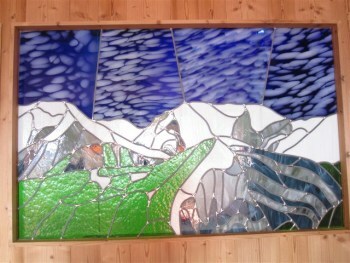 The result is a 25-foot continuous mural with peaks and glaciers easily identifiable to the local residents. Please visit my website to see more of my work, and be sure to come to my studio here in France if you are near Alpe d'Huez! 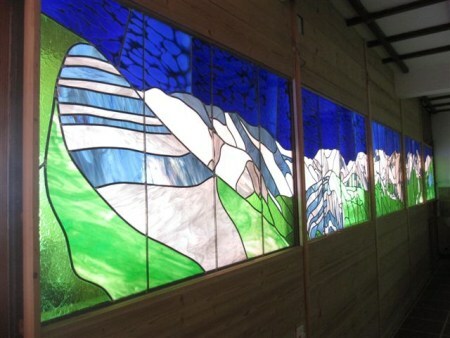 Trained as a civil engineer, David started working with stained glass as a hobby. Soon it grew into a passion, and he opened his first studio in January 2005. He especially enjoys creating designs seldom considered in the medium, such as works influenced by Picasso or Matisse cutouts. He has great reverence for time-proven methods, and enjoys breathing new life into the work of a previous generation of craftsmen. He feels closest to his work when he can leave the power tools unplugged and take the time to use materials and equipment from past centuries. He finds each project to be an opportunity to learn new skills, solve problems, and preserve a part of history for future generations. Now living in Huez France, high in the French Alps, Dave continues to create stained glass panels as well as popular bicycle trophies that combine colored glass with recycled bike parts. 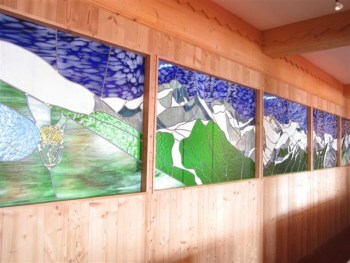 Dave's services and glass works are available in both France and the United States. You can contact David via email. Normally we include the Glass Eye 2000 file for each design in this series. Unfortunately the file for this design has been lost.